What documents do you need to make medical decisions for your parents? What documents do you need to help your parents make medical decisions? There may come a day when your parents want or need your help managing their health and making healthcare decisions. To make sure you’re prepared if the situation arises, it’s helpful to start a conversation with your parents before they’re facing a pressing need or crisis so you can have all the necessary documents in hand when they’re needed. HIPAA authorization: This allows physicians and other healthcare providers to share information with you. If there are certain types of information your parents do not wish to share, they can indicate that on the form. You can find generic HIPAA forms online or get one from your primary care physician. Advance directive: An advance directive, which is sometimes also called a living will, outlines what medical care you do and do not want if you are dying or not expected to regain consciousness and under what circumstances these decisions should be applied. For example, do your parents want to undergo CPR or defibrillation if their heart stops, be put on a ventilator, or have a feeding tube? Your parents can write their own advance directive, get a template from their physician, have a lawyer draw up the document, or get a form from their state’s health department or department on aging. Durable power of attorney for healthcare: This indicates who you would like to be responsible for making medical decisions on your behalf. This person is called a healthcare proxy. Your parents can indicate whether they would like their proxy to be able to make all medical decisions or just specific ones. Durable power of attorney: This allows you to make financial decisions on your parents’ behalf, pay bills, and access financial information, including talking with health insurers, long-term care insurance providers, and hospital and healthcare provider’s billing departments. Comprehensive medical record: Having an up-to-date, easily accessible, comprehensive medical record is especially important if your parents are being treated for several health issues. People with multiple health issues often see several specialists in addition to their primary care doctor and may be prescribed medications by multiple physicians. Their medical record can help make sure that key information is available to everyone who treats them and can lower the risk of overtreatment, duplicate diagnostic testing, and prescription drug interactions or the prescription of duplicate or no longer needed medications. Do not resuscitate and/or do not intubate order, if desired: While this information is often included in an advance directive, if your parents do not want to be resuscitated in the event their heart stops or put on a ventilator, it can be helpful to have a separate order that is shared with their physicians, EMTs, hospital and other healthcare facility staff, and staff at any senior living or rehabilitation facility. 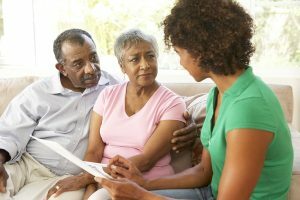 Medicare, supplemental, and long-term care insurance policy information: You need the policy numbers and customer service phone numbers for these insurance policies so you can review coverage, file, check, and dispute claims, and pay premiums on your parents’ behalf. Letter of instruction: This document details end of life wishes, for example funeral and/or memorial service arrangements, burial or cremation plans, and organ and tissue donation. A letter of instruction also often includes important financial information such as the location of the will and any safe deposit boxes, bank, investment, and retirement account locations and numbers, PIN numbers and passwords for banking and investment accounts, life insurance information, and a list of financial and legal advisors’ contact information. With these documents, you’ll be able to help your parents navigate the healthcare system and support them as they make important decisions about their health.